I get the marketing e-mails from 409Shop and the QYT KT8900 dual-band mobile caught my eye - just because the price was less than $100. It's like Leixen 898 but with some more "juice". 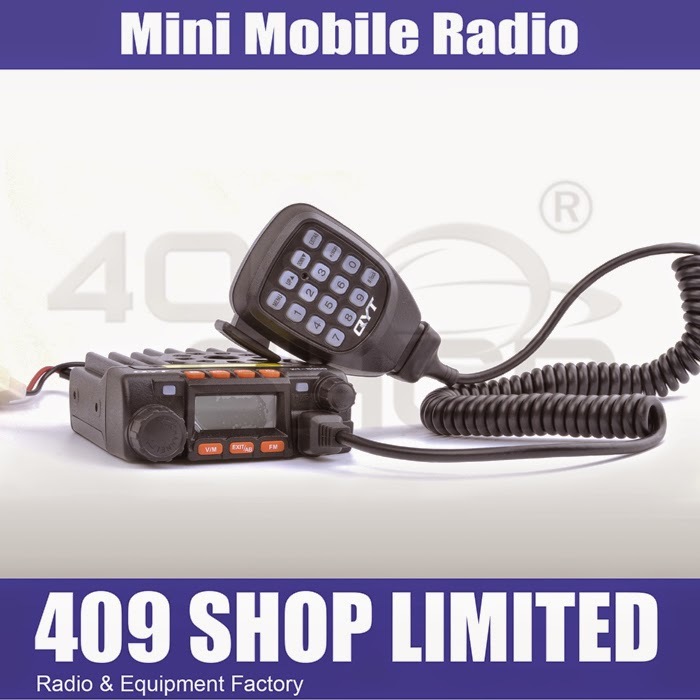 Does the radio have a CE mark for use in Europe? I fent. Will report once it's in hand and on a dummy load or antenna. I currently have a VV808SU, VV808SV, VV898. But I bought one anyway. Help me, Please!!! John - look forward to hearing how you like it! Mine arrived this morning. Took just 5 days from Hong Kong. The rig is indeed tiny. It fired up OK. 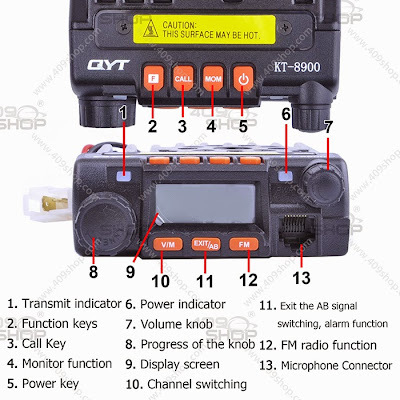 The supplied instruction sheet that came with it was the worst translation of Chinglish I've ever come acroos - and it was for a different model of radio, the KT-UV980. No data cable and no indication of where to plug said cable in either. Mine got here. Purchased via Amazon, it's the Juentai JT-6188 implementation of the same rig. I've been able to get some simplex channels stored and named. I've gotten duplex settings working in vfo mode, but seem to be having issues getting offset saved to channel assignments. Will work through it a bit and see if I can make heads or tails out of that. Generic USB cable for I-F26 or Y-VX160 do not work with ths radio. ... and there is an alpha display. For channel name assignments, you must program the memory for the frequency, then go back into the channel name mode, enter the name (note: mic buttons much faster than trying to spin the knob on this), and then give it the memory number to assign the name to. Yo tengo la QYT KT UV980 que por lo que veo los menus son similares. Para introducir los repetidores programo primeramente la frecuencia de salida con el desfase - que le corresponda y lo almaceno en una memoria. Posteriormente hay que desde el modo VFO introducir la frecuencia de entrada del repetidor y almacenarla en la misma memoria en la se ha almacenado la de salida. A mi me ha funcionado bien así. Via Google Translate... "I have the QYT KT UV980 that I see, the menus are similar. To enter schedule the first repeater output frequency with the phase - that corresponds and stored in a memory. Then you have to enter from the VFO frequency repeater input and stored in the same memory on has been stored the output. To me it has worked fine." I am having big problems storing a channel memory and then making it transmit properly. Any solutions? In other words when I'm not in channel mode everything works fine. After I program and save the channel and then switch to channel mode, the offset does not show up for repeater operation.... WTF??? It was a pleasure to receive a QYT KT8900 mini-transceiver. The programming instructions are not written for the radio operator but rather for the computer programmer. Faulty cross references exist in the instruction guide. This cute little transceiver could really be a bombshell if someone would develop a CD instead of offering a download which cannot be utilized by some operating systems. The transceiver design and layout for the price range is quite good when one considers what is usually on $140 product is about 10 watts of output. Some TYT models have been improved with a Kenwood microphone for better dynamic audio in transmit mode. Is there a replacement microphone for the QYT KT-8900? Radios in this class are flooding the worldwide market because of the Chinese dumping efforts to secure the market place. It appears American support teams are going to have to develop a technical support system for these bottom end market sets. Without this effort, one will pay for the unit in other ways trying to make it operational. re: "This cute little transceiver could really be a bombshell if someone would develop a CD instead of offering a download which cannot be utilized by some operating systems." Are you referring to the .rar file type? If so, download 7-zip and use it to extract the compressed files. .rar is much more common in Asia than the .zip files we see in the US. Does anyone know of a way to convert the manual to something more "user friendly"? I've only see the image files - no PDF or other version. http://www.miklor.com/KT8900/KT8900-Program.php. There is a program for programing this radio somewhere on the sight. But its not listed under the QYT brand but its the same radio. Ok I got it program using windows, but now sometimes when some keys the repeater my radio locks up, like the squelch will not open it up. Not always but quite frequently. Starting to get annoyed at this little beast. Any ideas anyone? Or has anyone else had a similar problem??? Change from Menu to Menu by pressing the [Exit/AB] button. Set radio to VFO Mode by pressing [V/M] Channel number at right will disappear. Select and press: [MENU] press 37 on key pad, press [F] rotate large knob to CH-012 and press [F]. Press [EXIT A/B] to exit. In VFO, press [EXIT/AB] to select Upper display and enter RX frequency 146175 using the key pad. Press [EXIT/AB] and again select the Upper display. In VFO, and with the upper received frequency selected, Press [MENU], Press 13 on keypad, then press [F] and rotate large knob to desired T-CTCS tone of 123.0, then press [F]. Press [EXIT/AB] to Exit and save. Forth, now to SAVE a selected repeater frequency to a Memory Channel. It is not necessary to enter a positive or negative offset for the memory channel, as you will be entering both the RX and TX frequency and saving this to a selected memory channel. Now, in VFO, with the Upper frequency selected and having entered the TX tone if required, Press [MENU], press 36 on key pad and then press [F]. rotate large knob and select CH-008 and then press [F]. Press [EXIT/AB], RX has been added. Now, using the [EXIT/AB] key, select the Lower frequency. Press [MENU], press 36 on key pad, Press [F], rotate large knob to CH-008 and then press [F]. Press [EXIT/AB], TX has been added. Press [V/M] to return to Memory Mode. Channel number will re-appear. Well after two months in the summer Miami sun mounted on my dash, I declare it is well worth the money. Still going strong, no real complaints for $100. If in doubt, buy it. Just received my QYT KT-8900, must say after looking through the menus and watching a YouTube Video on programming this , I found it fairly simple to save a repeater with offset and T-CTCSS into MEM00 , much like the Baofeng UV-5R method , you do have to save both the Transmit and Receive into the same channel or you'll get Simplex mode. I got my Radio 3 weeks ago. Result until now, never would buy it again. Trouble with bad muffy Modulation, pulsing Sound Audio during drive in car. And a lot of rf emi in the car electronics. Think by line on the 12 V plug. Sorry guys thats truth. I told only the have of Problems. That all is not funny. How do you change the TX power on a saved channel. I saved a channel on low power, but when I go into the menu and change it to high, it won't stick. On VFO mode if I change it, it will save it just fine and transmit on high power. On the Baofeng handhelds pressing the # button does the trick, but that doesn't seem to work on this. You need to re-save the channel, including all the settings (freq, offset, power, tone, etc. ), over again. I bought this radio few weeks ago. Never would buy this again. Really no good modulation weak and muffy, everbody told me this. Tried this by changing the mic capsule . Seems me a general design bug. Heard this from a lot of radios of the same type. Also have problems in car use. RF on the 12V line makes EMI trouble in car electronics. By driving is the received audio totally cracked. Seem to be failfunction of squelch by fading. The time constant of squelch function is to short. No good radio deal at all. Some helpful reviews here . i purchased this yesterday.I am a foundation licence here in the UK. I also have a baofeng UV 5R and I am trying to store my local repeater. I will give some feedback shortly. i have a moonraker mt-270m same as the qyt-8900 today i turned it on to have a qso with a local and there was no sound upon opening the radio i see a chip blown in 1/2 LA42??? any one know the chip number so i can order a new one its the audio chip i presume..
What is a replacement final transistor equiv? They blow very quickly at 13.8v and lots of 'dead' 8900's around now!!! No answer from above...... any-one home? This is a 8W 7.5V part. I just purchased a KT-8900R and popped it open to see. I get 35W on HIPWR at 144MHz quickly dropping to 16W after about 30 seconds at 12.7V. Not bad for an 8W part. I can see why they die at 13.8V, especially if they key up with out a load. I’ll keep it on LOPWR ! I have programmed a QYT KT-8900 with RT Systems software and cable, everything went in just fine but it will not transmit on GMRS frequincy. any ideas?